I have a friend whose mother makes the most amazing pickled vegetables. Seriously, if you put them next to a tray of peanut butter brownies, I might still reach for the pickled veggies. She’s given me the recipe but I’ve yet to actually make them. I guess I get nervous because you have to pre-salt all of the vegetables and the amount of salt needed isn’t specified. I’m worried that I’ll overdo it with the salt and, even after rinsing them, will end up with a several pounds of ruined, salty produce. Hey, it’s happened. Daikon kimchi, I’m talking to you. But when I saw this soup recipe, I was pretty sure I wouldn’t be able to mess it up. It’s quick, easy, refreshing and as pretty as a picture. Sweet, salty, sour with just a little bit of heat, it’s a really nice way to balance out a spicy Korean meal. If you have a love of sour foods like me (any other Traditional Chinese Medicine Wood element folks out there? ), I think you’ll enjoy this one. I also wanted to let you guys know about a cool Foodgawker/Photograzing-like site specifically for Korean food. It’s called Korean Food Gallery and it’s a great place to find inspiration for your next Korean meal. For you food bloggers, it’s another place to post photos of your favorite Korean recipes. Thanks to Jenny for letting me know about it! 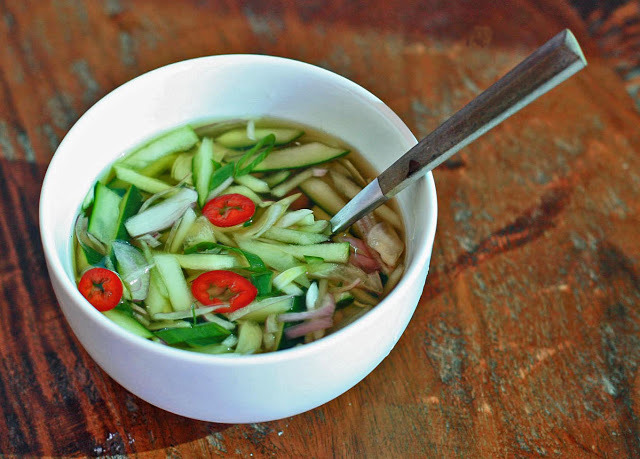 In a large bowl, combine the cucumbers, shallots and salt. Set aside. In a medium bowl, combine the vinegar, sugar, soy sauce and water. 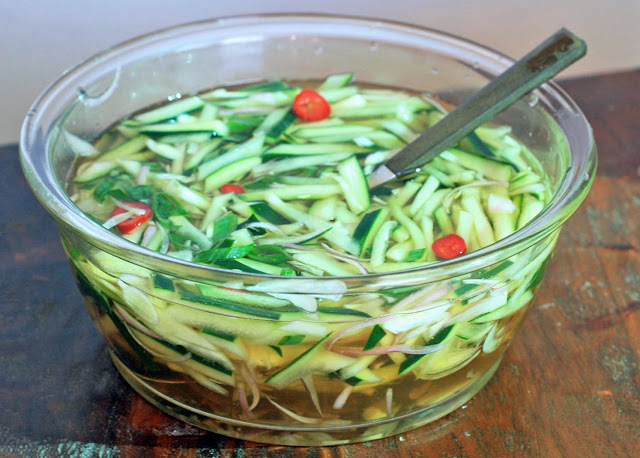 Add this mixture to the cucumber. Add the green onions and mix well. Place in the refrigerator until well chilled. Garnish with red pepper rings. Add an ice cube or two in each bowl to keep the soup extra cold, if desired.